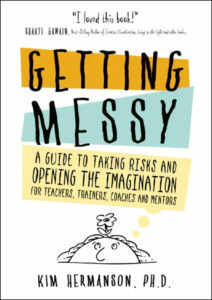 paperback: Getting Messy: A Guide to Taking Risks and Opening the Imagination for Teachers, Trainers, Coaches and Mentors. Need inspiration? Get projects flowing again with immediate evocative imagery. If you’re stuck in any way, taking a short pause to do one of these creative exercises will get your ideas flowing, not to mention making new neuro-pathways in your brain. If you’re a teacher or workshop leader, these exercises are great for ice-breakers. The exercises are designed to inspire connection and conversation; they’ll foster communal bonds and a sense of meaning. 200+ exercises. What would it be like to teach a fresh new course in YOUR business? 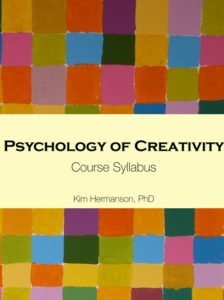 My six-session Psychology of Creativity course has been sought after, and I’m finally making it available. The course can be easily adapted for a workshop or alternative adult learning format. Purchase price of $250 includes 28-page detailed course syllabus with lesson plans, handouts, and a wealth of creative ideas for group activities. The price also includes a license to teach this course. If you’re interested in purchasing this course, please click here to fill out the application form. I’ve had so many people ask me about my original research into the power of metaphor, so… I’m going to sell my signature graduate psychology course that initiated my profound journey into Third space. If you’re interested in learning more about metaphoric images or incorporating them into your current work, you will not find this material anywhere else. Much of this research is based on writings that have been out-of-print and inaccessible to the general public for decades. Purchase price of $500 includes a 40-page detailed course syllabus with lesson plans, class activities and handouts. It also includes a license to teach this course if you so choose. While the content was originally developed for graduate students, it can easily be adopted for a workshop or alternative adult learning format. 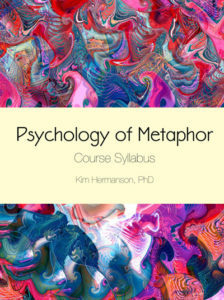 Handouts include: A Summary of Concepts about Metaphor, Quotes about Metaphor, Primary Metaphors for Change, Metaphor and Aesthetic Experience, and Observations from Lakoff & Johnson’s Metaphors We Live By. When I began teaching, I wanted to know how to teach in a way that would not only inspire my students’ creativity and learning, but my own as well. I read everything I could find on teaching and took every course that looked helpful. Mostly, I looked outside of the field of education for inspiration and I began to put together my own theory of teaching and learning. I eventually wrote Getting Messy and then a funny thing happened. Readers told me that the book wasn’t just about teaching. It was about opening space for the creative. Teaching is a messy process. Messy means we’re human, we make mistakes, and often when we’re trying something for the first time, we have no idea how it’s going to turn out. But it’s only when we step out of the mold and allow a little disarray that learning and growth begin to happen. Getting Messy is a friend and guide for those times when you find yourself feeling trepidation about stepping into an unknown place.